Straits Settlements: 1867, 1½c on ½a blue, SG 1. Fine used. Straits Settlements: 1867, 2c on 1a deep brown, SG 2. Fine used. 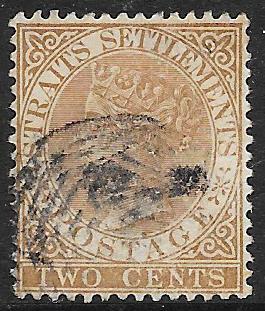 Straits Settlements: 1867, 8c on 2a yellow, SG 6. Fine used. Straits Settlements: 1867, 12c on 4a green, SG 7. Fine used. Straits Settlements: 1867, 24c on 8a rose, SG 8. Fine used. Straits Settlements: 1867-72, 6d dull lilac, SG 13. Fine used. Straits Settlements: 1867-72, 6d bright lilac, SG 13a. Fine used. 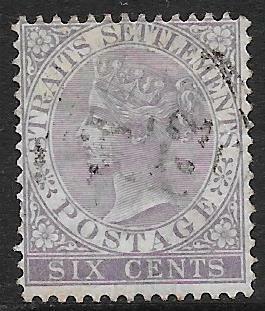 Straits Settlements: 1867-72, 6d dull lilac wmk inverted, SG 13w. Fine used. Straits Settlements: 1867-72, 32c pale red, SG 18. Very fine used. Straits Settlements: 1867-72, 96c grey, SG 19. Fine used. Straits Settlements: 1882, 2c brown, SG 50. Fine used. 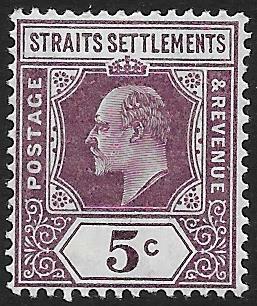 Straits Settlements: 1883-91, 12c brown-purple, SG 67. Mounted mint. Straits Settlements: 1892-99, 25c purple-brown & green, SG 103. Mounted mint. Straits Settlements: 1902-03, 50c dull green & carmine, SG 118a. Fine used. 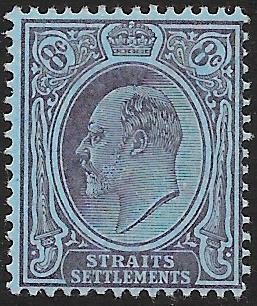 Straits Settlements: 1904, 8c purple/blue, SG 126. Lightly mounted mint. Straits Settlements: 1910, 1c blue-green, SG 127b. Mounted mint. 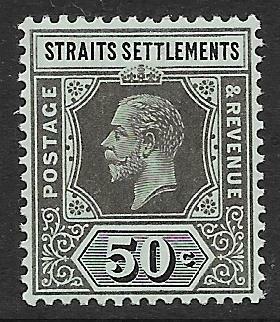 Straits Settlements: 1906, 3c dull purple, chalk-surfaced paper, SG 128a. Mounted mint. 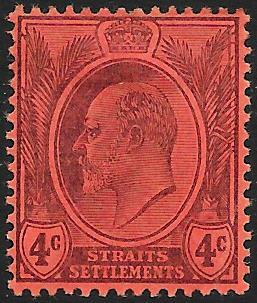 Straits Settlements: 1904, 4c purple/red, SG 129. Mounted mint. 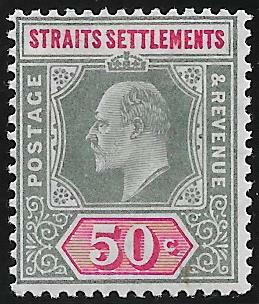 Straits Settlements: 1906, 5c dull purple, SG 130. Mounted mint. Straits Settlements: 1905, 8c purple/blue, SG 131. Mounted mint. 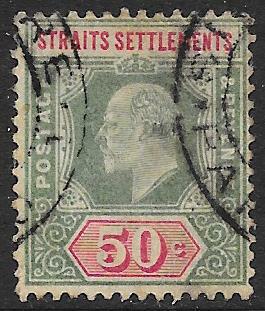 Straits Settlements: 1905, 25c dull purple & green, SG 133. Mounted mint. Straits Settlements: 1905, 25c dull purple & green on chalk-surfaced paper, SG 133a. Mounted mint. Straits Settlements: 1904-10, 25c dull purple & green, SG 133a. Fine used. 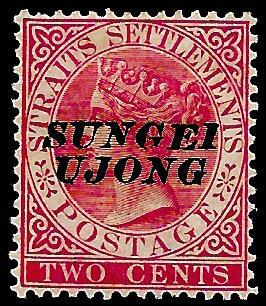 Straits Settlements: 1905, 30c grey & carmine, SG 134. Mounted mint. 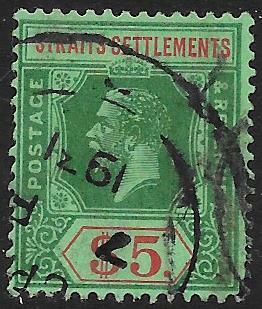 Straits Settlements: 1905, 50c dull green & carmine, SG 135. Light mounted mint. 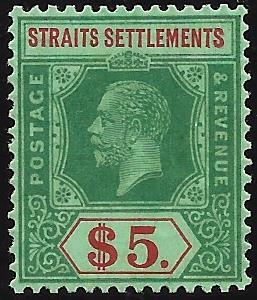 Straits Settlements: 1905, $1 dull green & black, SG 136. Mounted mint, toned perfs. 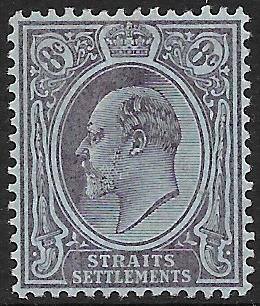 Straits Settlements: 1905, $2 dull purple & black, SG 137. Light mounted mint. Straits Settlements: 1912-23, 50c black/blue-green, SG 209a. Very light mounted mint. Straits Settlements: 1912-23, $2 green & red/yellow, SG 211a. Fine used. Straits Settlements: 1912-23, $5 green & red/green, SG 212. Fine used. 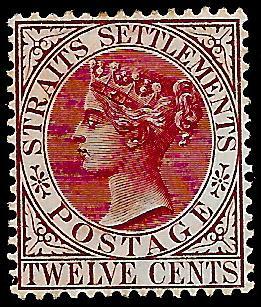 Straits Settlements: 1917, 4c + 2c dull purple, SG 217. Very fine used. Straits Settlements: 1933, 10c purple/bright yellow (Die I), SG 231ba. Mounted mint. Straits Settlements: 1921, 25c dull purple & mauve (Die 1, type 1), SG 234. Mounted mint. Straits Settlements: 1926, $5 green & red/green, SG 240a. Lightly mounted mint. Straits Settlements: 1926, $5 green & red/green, SG 240a. Fine used. 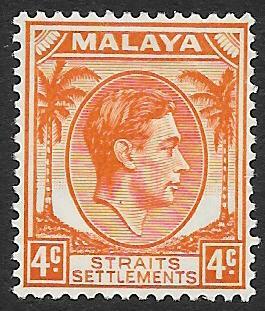 Straits Settlements: 1937-41, 4c orange, SG 280. Mounted mint. Straits Settlements: 1937, 5c brown, SG 281. Mounted mint. 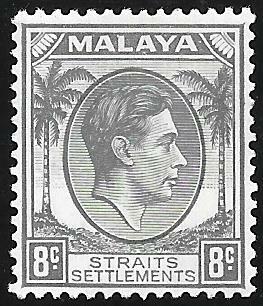 Straits Settlements: 1937-41, 8c grey, SG 283. Unmounted mint. Straits Settlements: 1937-41, 8c grey, SG 283. Lightly mounted mint. 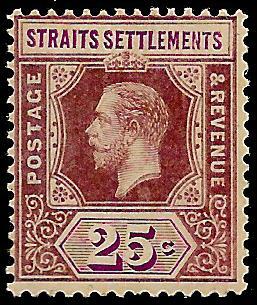 Straits Settlements: 1937-41, 25c dull purple & scarlet, SG 286. Lightly mounted mint. Straits Settlements: 1937-41, $2 green & scarlet, SG 291. Mounted mint with light gum toning. Straits Settlements: 1937-41, $5 green & red/emerald, SG 292. Mounted mint with light gum toning. 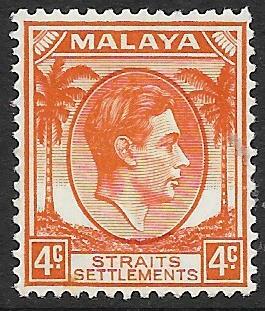 Straits Settlements: 1937-41, 4c orange, Die II, SG 296. Lightly mounted mint. 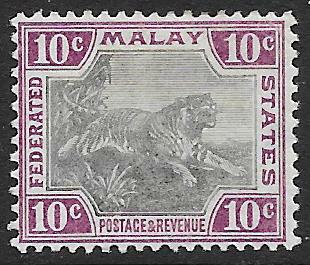 Federated Malay States: 1900, 2c dull purple & brown, SG 2. Fine used. Federated Malay States: 1900, 50c green & black, SG 8. Fine used. 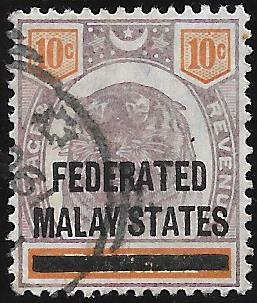 Federated Malay States: 1900, 10c dull purple & orange, SG 10. Fine used. Federated Malay States: 1900, $1 green & pale green, SG 11. Fine used. Federated Malay States: 1900, $2 green & carmine, SG 12. Fine used, slightly pale colour. Federated Malay States: 1900-01, 3c black & brown, SG 16. Mounted mint. 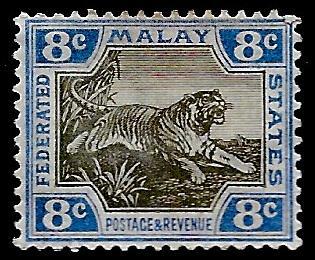 Federated Malay States: 1900-01, 8c grey & ultramarine, SG 19a. Mounted mint. 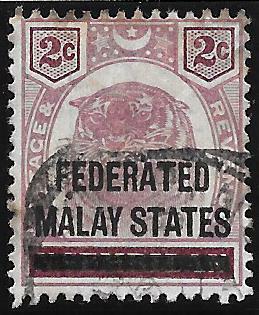 Federated Malay States: 1900-01, 8c grey-brown & ultramarine, SG 19b. Mounted mint. Federated Malay States: 1900-01, 10c grey & purple, SG 20c. Mounted mint. 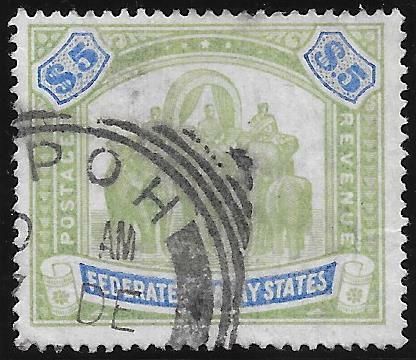 Federated Malay States: 1900, $5 green & bright ultramarine, SG 25. Fine used, slightly pale colour. 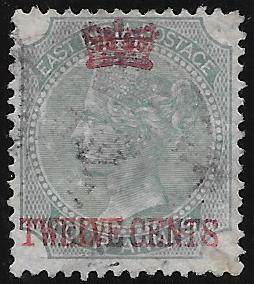 Federated Malay States: 1904-22, 1c grey-brown & green, SG 27a. Mounted mint. 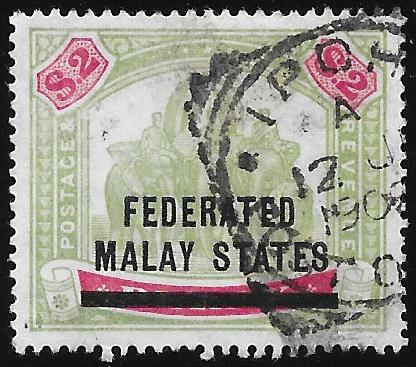 Federated Malay States: 1906, 1c grey & green, SG 28. Mounted mint. 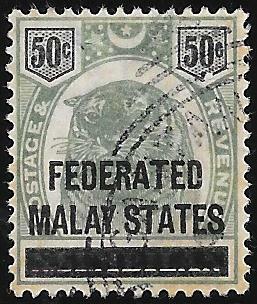 Federated Malay States: 1904, 3c grey & brown, SG 32. Mounted mint. Federated Malay States: 1906, 3c grey-brown & brown, SG 32a. Mounted mint. 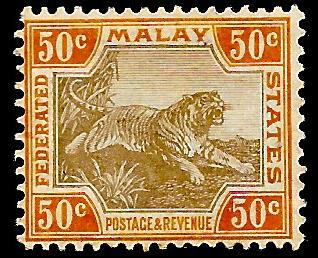 Federated Malay States: 1904-22, 50c grey-brown & orange-brown, chalk surfaced paper. SG 47cb. Mounted mint. 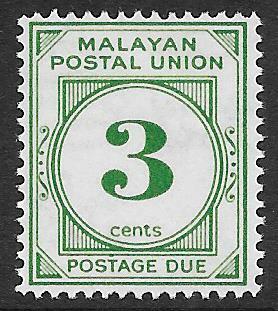 Malayan Postal Union: 1936, 4c green, SG D2. Mounted mint. 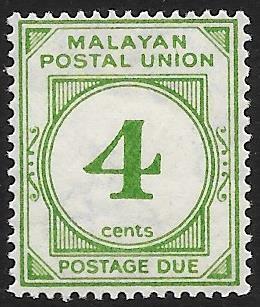 Malayan Postal Union: 1951-63, 3c deep green, SG D16. Unmounted mint. 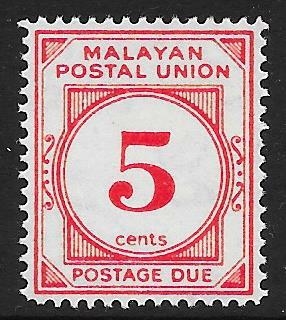 Malayan Postal Union: 1951-63, 5c vermillion, SG D18. Unmounted mint. 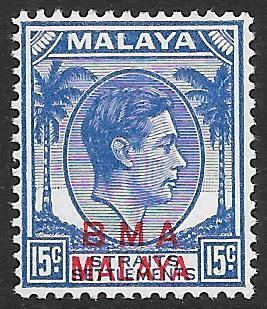 Malaya (BMA): 1945-48, 15c blue, SG 12b. Lightly mounted mint. 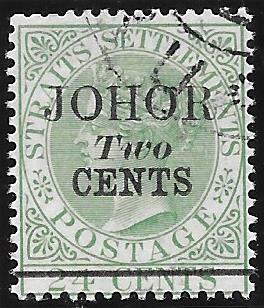 Johore: 1891, 2c on 24c green, SG 18. Fine used. 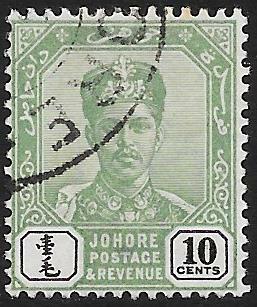 Johore: 1898, 10c green & black, SG 46. Fine used. 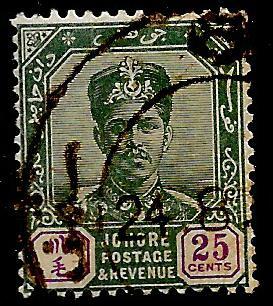 Johore: 1898, 25c green & mauve, SG 47. Fine used. 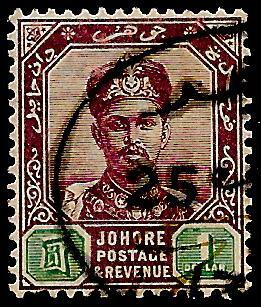 Johore: 1898, 50c green & carmine, SG 48. Good used. 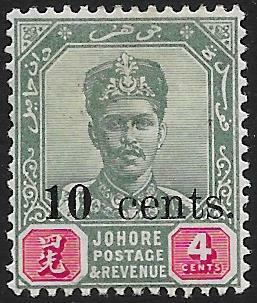 Johore: 1898, $1 dull purple & green, SG 49. Mounted mint. 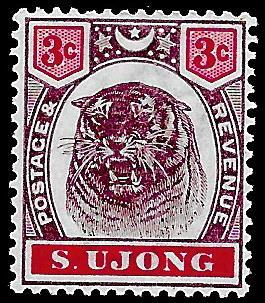 Johore: 1898, $1 dull purple & green, SG 49. Very fine used. Johore: 1903, 3c on 4c yellow & red, original value uncancelled, SG 54a. Fine used. Johore: 1903, 10c on 4c green & carmine, original value uncancelled, SG 55b. Mounted mint. 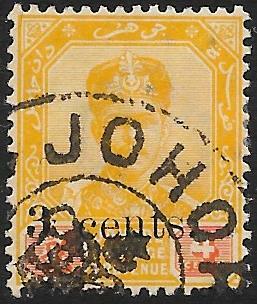 Johore: 1904, 10c on 4c yellow & red, SG 58. Very lightly mounted mint. 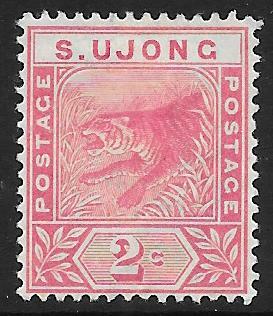 Johore: 1910, 2c dull purple & orange, chalk-surfaced paper, SG 62a. Fine used. 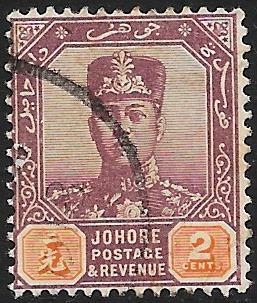 Johore: 1904-27, 10c dull purple & black, SG 67. Mounted mint. 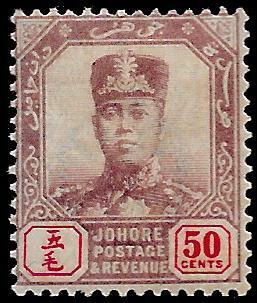 Johore: 1904-27, 50c dull purple & red, SG 69. Mounted mint. 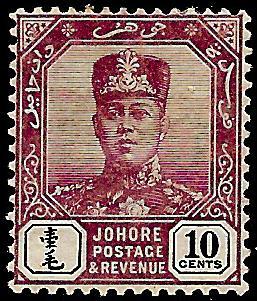 Johore: 1940, 8c black & pale blue, SG 130. Mounted mint. 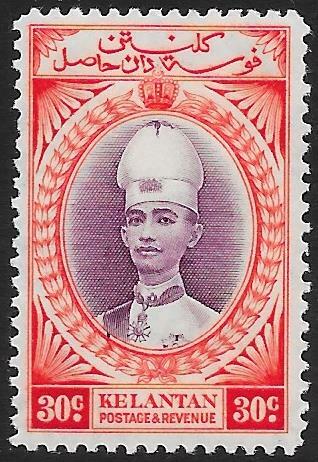 Kedah: 1912, $5 black & red, SG 14. Mounted mint. Kedah: 1919, $1 on $3 black & blue/blue, SG 25. Mounted mint. 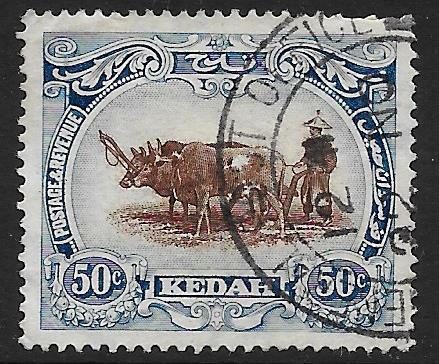 Kedah: 1927, 10c blue & sepia, wmk crown to left of CA, SG 30c. Mounted mint. 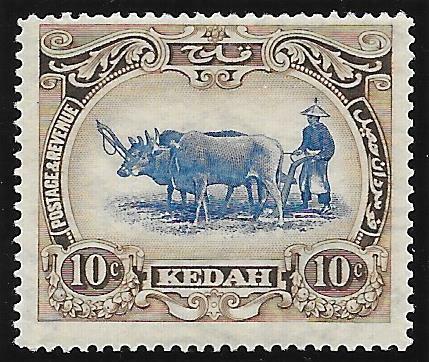 Kedah: 1921-32, 50c brown & grey-blue, SG 36. Very fine used. 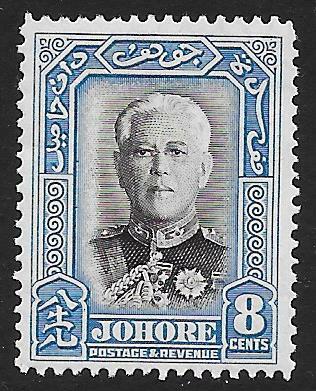 Kedah: 1921-32, $3 black & blue/blue, SG 39. Mounted mint. 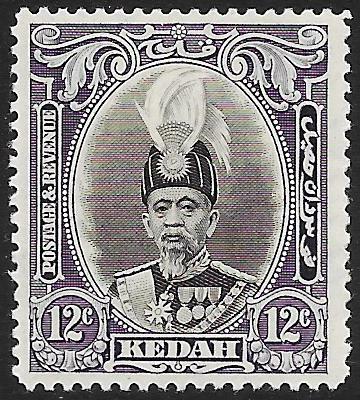 Kedah: 1922, 21c mauve & purple, SG 42. Mounted mint. 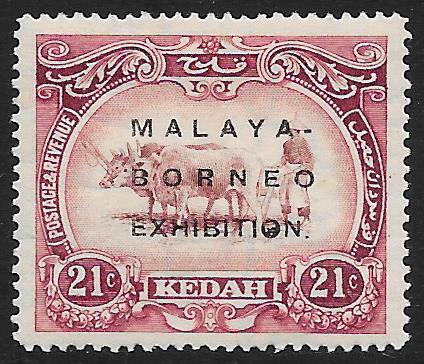 Kedah: 1922, 10c blue & sepia, raised stop after "EXHIBITION", SG 48c. Mounted mint. 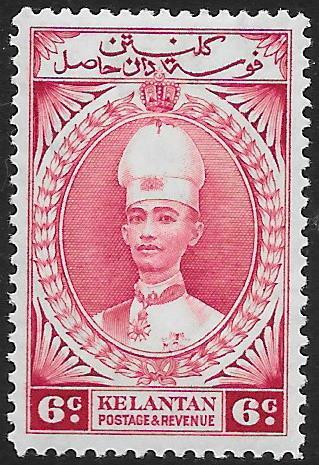 Kedah: 1922, 21c mauve & purple, SG 49. Mounted mint. Kedah: 1922, 25c blue & purple, SG 50. Mounted mint. 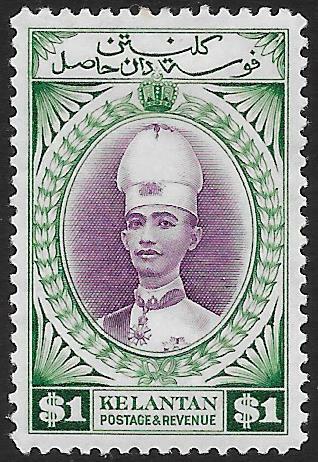 Kedah: 1922-40, 35c purple, SG 59. Marginal mounted mint. 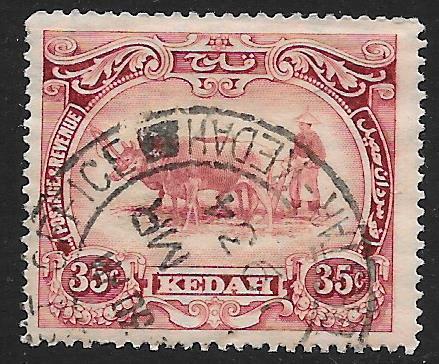 Kedah: 1922-40, 35c purple, SG 59. Very fine used. Kedah: 1937, 12c back & violet, SG 61. Mounted mint. Kedah: 1937, $5 black & scarlet, SG 68. Very lightly mounted mint. Kedah: 1937, $5 black & scarlet, SG 68. Fine used. 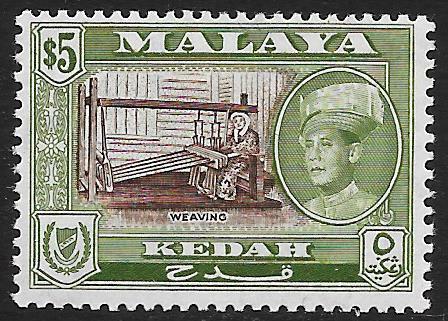 Kedah: 1938-40, 1c black, SG 68a. Unmounted mint. 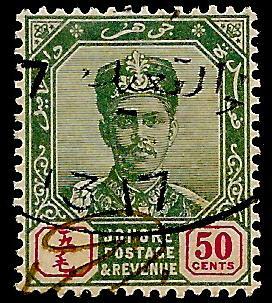 Kedah: 1940, 2c bright green, SG 69. Lightly mounted mint. Kedah: 1948, Silver Wedding $5 carmine, SG 71. Marginal unmounted pair. Kedah: 1957, $5 brown & bronze-green, SG 102. Lightly mounted mint. Kedah: 1962, $5 brown & bronze-green, perf 13x12½, SG 114a. Lightly mounted mint. Kelantan: 1911-15, $1 green & emerald. SG 9. Mounted mint. Kelantan: 1924, $1 green & brown. SG 12. Mounted mint. Kelantan: 1922 Malaya-Borneo Exhibition, $1 green & brown. SG 34. Mounted mint. 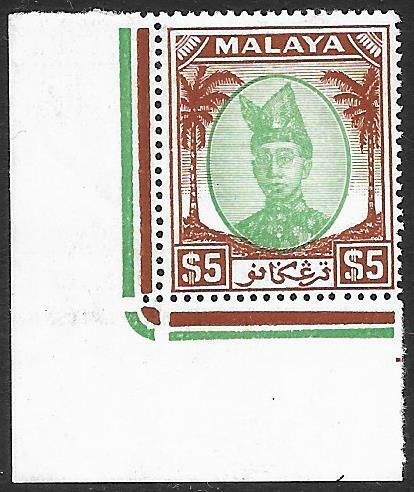 Kelantan: 1922 Malaya-Borneo Exhibition, $5 green & blue. SG 36. Mounted mint. Kelantan: 1937, 6c lake. SG 44. Lightly mounted mint. Kelantan: 1937, 30c violet & scarlet. SG 49. Mounted mint. Kelantan: 1937-40, 40c orange & blue-green. SG 50. Very fine used. 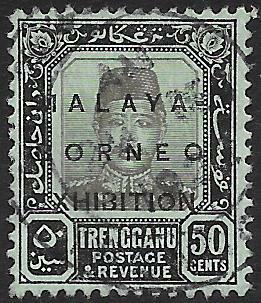 Kelantan: 1937, 50c grey-olive & orange. SG 51. Mounted mint. Kelantan: 1937, $1 violet & blue-green. SG 52. Mounted mint. Kelantan: 1940, $5 vermillion & lake. SG 54. Lightly mounted mint (light gum toning). Kelantan: 1951-55, $2 green & scarlet. SG 80. Mounted mint. Kelantan: 1951-55, $5 green & brown. SG 81. Mounted mint. Negri Sembilan: 1855-90, 2c pale rose, SG 38. Mounted mint. Negri Sembilan: 1887, 2c pale rose, SG 42. Mounted mint. Negri Sembilan: 1891-94, 2c rose, SG 50. Mounted mint. 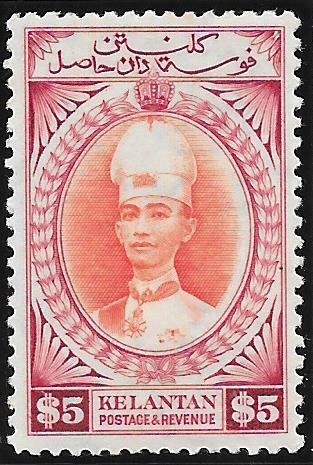 Negri Sembilan: 1895, 3c dull purple & carmine, SG 55. Mounted mint. 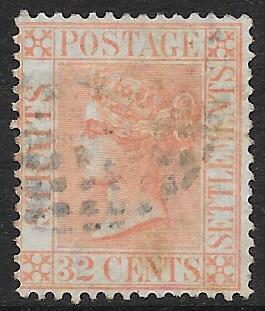 Pahang: 1889, 2c pale rose, SG 4. Mounted mint. Penang: 1957, Complete set of 11, SG 44-54. Fine used. 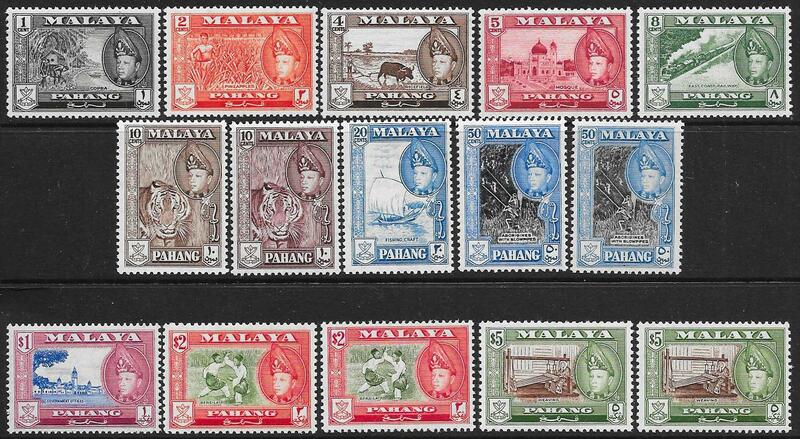 Penang: 1957-62, Complete set of 15, SG 75-86a. Mounted mint. Perak: 1881, 2c pale brown, SG 5. Mounted mint. 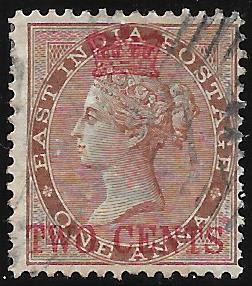 Perak: 1899, 4c dull purple & carmine, SG 69. Mounted mint. 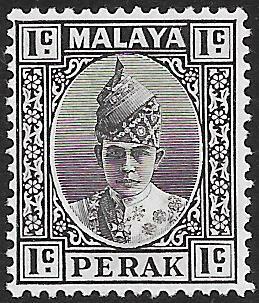 Perak: 1939, 1c black, SG 103. Mounted mint. 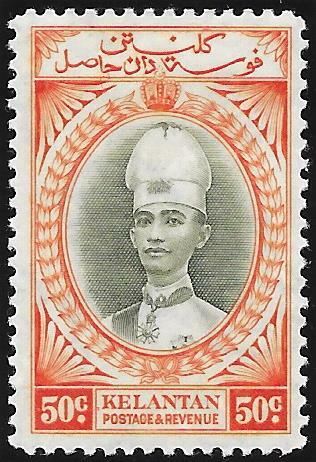 Perak: 1939, 4c orange, SG 107. Mounted mint. 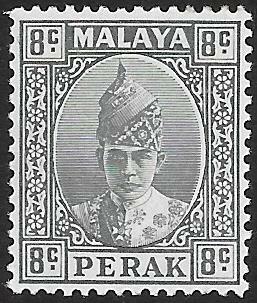 Perak: 1938, 8c grey, SG 110. Mounted mint. 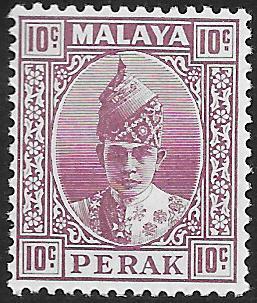 Perak: 1938, 10c dull purple, SG 112. Mounted mint. 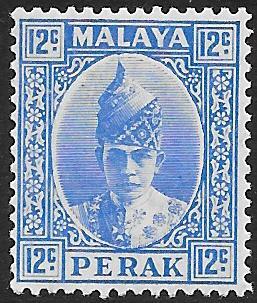 Perak: 1938, 12c bright ultramarine, SG 113. Mounted mint. 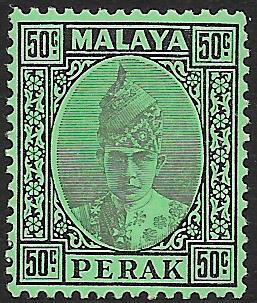 Perak: 1938, 50c black/emerald, SG 118. Mounted mint. Perak: 1940, $1 black & red/blue, SG 119. Lightly mounted mint. Perak: 1940, $2 green & scarlet, SG 120. Lightly mounted mint. Selangore: 1895-99, 50c dull purple & greenish black, SG 59. Very fine used. Selangor: 1935-41, $2 green & scarlet, SG 84. Mounted mint. Selangor: 1941, $1 black & red/blue, SG 86. Mounted mint. Selangor: 1941, $2 green & scarlet, SG 87. Mounted mint, toned gum. Selangor: 1948, Royal Silver Wedding set, SG 88-89. Very fine used. 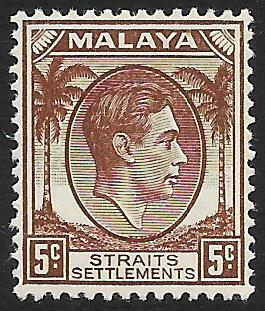 Trengganu: 1938, 3c reddish brown, SG 29. Mounted mint. 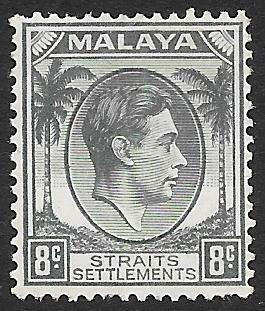 Trengganu: 1938, 8c grey, SG 34. Mounted mint. Trengganu: 1926, $3 green & lake/green, SG 43. Lightly mounted mint. Trengganu: 1938, $5 green & red/yellow, SG 44. Lightly mounted mint. 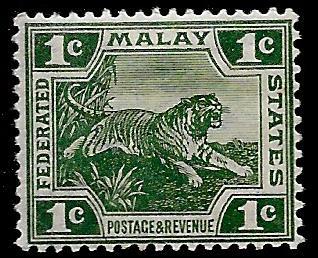 Trengganu: 1922 Malaya-Borneo Exhibition, 2c green, SG 48. Fine used. 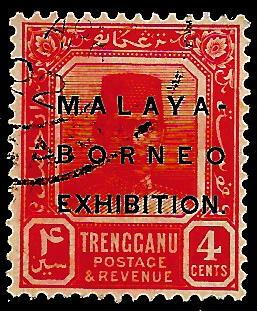 Trengganu: 1922 Malaya-Borneo Exhibition, 4c rose-red, SG 49. Fine used. 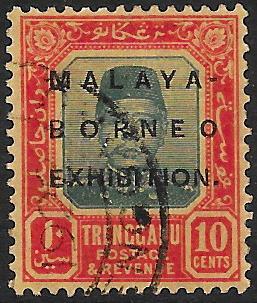 Trengganu: 1922 Malaya-Borneo Exhibition, 5c grey & brown, SG 50. Fine used. Trengganu: 1922 Malaya-Borneo Exhibition, 10c green & red/yellow, SG 51. Fine used. 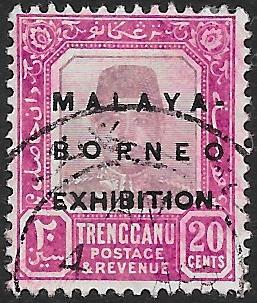 Trengganu: 1922 Malaya-Borneo Exhibition, 20c dull & bright purple, SG 52. Fine used. 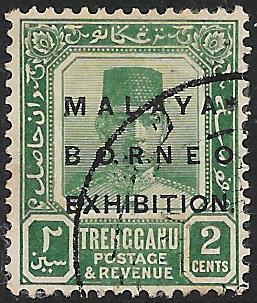 Trengganu: 1922 Malaya-Borneo Exhibition, 25c green & dull purple, SG 53. Fine used. 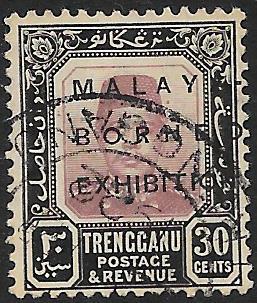 Trengganu: 1922 Malaya-Borneo Exhibition, 30c dull purple & black, SG 54. Fine used. 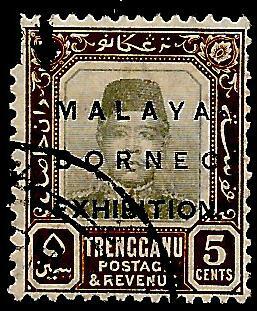 Trengganu: 1922 Malaya-Borneo Exhibition, 50c black/green, SG 55. Fine used. Trengganu: 1949-55, $5 green & brown, SG 87. Corner marginal mounted mint. Trengganu: 1957-63, $5 brown & bronze-green, SG 99. Lightly mounted mint. 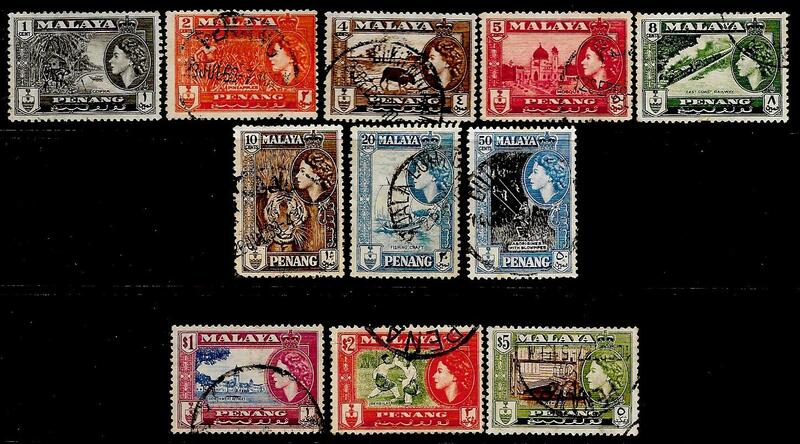 Trengganu: 1937, postage dues set. SG D1-D4. Lightly mounted mint. Japanese Occupation: 1942, 12c bright ultramarine, SG J243. Very fine used. 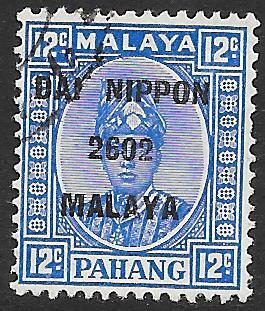 Japanese Occupation: 1943, 70c blue, SG J306. Unmounted mint.